Anchor’s Internal Communications team have been celebrating an array of award wins this week. Colleagues from the team attended the Institute of Internal Communications North & Central (IoIC) awards ceremony at the National Space Centre in Leicester last Thursday. Emma Halfpenney, Anchor’s Engagement Consultant said: “We are very proud to have been awarded these accolades by the Institute of Internal Communications Central & North awards. “We were thrilled to win Best in Class for Best Magazine and Best In-House Team, beating giants such as Barclaycard, Mercedes, Rolls Royce and Sainsbury’s. 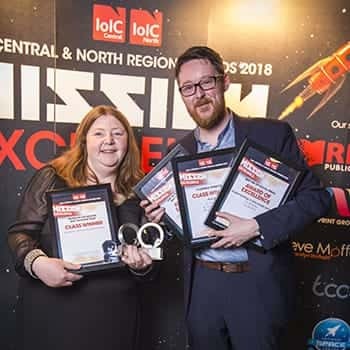 More than 200 internal communication professionals gathered at the National Space Centre for the IoIC Central & North Awards 2018 - the biggest and best celebration of regional internal communications talent. The IoIC Regional awards are an opportunity for organisations to demonstrate their work within their regional network with categories across strategy, campaigns, writing, design and delivery. Find out more about the awards Anchor have won on our Awards page.